Chic resorts, spectacular coastline and sleepy villages amidst stunning scenery there’s so much to see and do whilst staying at one of our holiday cottages with pools on the Cote d’Azur. Here’s our guide to the Top 10 Things To Do in this beautiful region. With its colourful markets, Mediterranean climate and fabulous location, Nice has been a popular tourist destination for 250 years. The construction of its famous seafront Promenade des Anglais, on the Bay of the Angels, began in the late 18th century as wealthy visitors from more northerly climes began to arrive, fleeing the winter weather back home. Just a stone’s throw away from here, the city’s Old Town houses a vast array of boutiques and restaurants offering some of the best world foods; at the centre of the pedestrian quarter lies the Place Massena with its striking architecture. Nice also boasts a botanic garden and chateau, with panoramic views available from its cliff-top perch and from nearby Mont Boron. These parallel, cliff-hugging roads twist and turn their way eastwards from Nice towards Monaco and the Italian border, offering stupendous views over the Riviera coastline and Mediterranean sea. The spectacular settings of the Grande Corniche, built along the line of a famous Roman road by Napoleon, and Moyenne Corniche have featured in many film shoots down the years; the lower Corniche Inferieure (Basse) links coastal towns and, like the higher routes, can become congested in the high season. Between Marseille and Cassis, the Riviera coastline is pierced by deep inlets and rugged limestone cliffs known as ‘calanques’. This dramatic scenery, with its unique flora and fauna, enjoys the protection of National Park status. Ideal for exploration on foot, way-marked trails have been created, however during the summer months sections can be closed to the public due to the risk of forest fires. Boat trips provide a great alternative way of discovering the secrets of these turquoise coves. This rocky range of red hills between St Raphael and Cannes offers an opportunity to escape the bustling coastline and appreciate some fine views across the region. The scenery owes its colour to the underlying ancient volcanic rock. At just over 2,000 feet (618 metres), its highest point is Mont Vinaigre which lies slightly inland but is a popular destination for walkers and cyclists. The arid landscape of cork oak and scrub enjoys protected status and there are several way-marked walking routes to follow. No holiday on the Riviera would be complete without a visit to the beach, but it’s hard to list a definitive Top Ten of these as people’s criteria differ. Posing on Paloma Plage (Cap Ferrat) below the mansions of millionaires, or basking on one of the public beaches around classy, but crowded, Cap d’Antibes is not to everyone’s taste. While busy Cannes beaches, off the famous La Croisette, have their appeal, quieter spots can usually be found at resorts like nearby Theoule-sur-Mer. The same applies to Nice and St Tropez; smaller neighbours like Villefranche, Port Grimaud and Rayol Canadel-sur-Mer offer less busy alternatives. Lying just off the Giens Peninsula, below Hyeres, the ‘Golden Isles’ are well worth a day trip. Ferries make frequent short crossings from Giens and other mainland ports to Porquerolles (the most accessible) and Port Cros (a national nature and marine reserve). The less-frequented third island, Le Levant, was formerly a penal colony and has no electricity supply. Today it is a centre for naturism; visitors are advised that nudism is obligatory on its only accessible beach and along much of its coastline. Most tourists choose Porquerolles, exploring it on foot or by bicycle; restrictions can be imposed to prevent forest fires and dogs are not allowed on its beaches. Port Cros enjoys protected status and visitors are asked not to leave its way-marked paths or smoke during their stay. The Medieval village of Eze enjoys a lofty perch on the Cap Ferrat peninsula offering superb views over the Mediterranean from its exotic cactus gardens. Here, the scents of the local perfume industry can be sampled in boutiques and stalls which line the winding streets. Twelve miles inland, in the hills above Cannes, lies the busy fragrance town of Grasse, with its perfumeries and museums dedicated to floral essences and, more recently, food flavourings. The medieval walled town of St Paul de Vence is another popular tourist destination around half an hour’s drive due west from Nice. Further west still, charming Bargemon is an hour-and-a-half’s drive from Nice along roads winding up through the olive groves. Monaco is an independent principality, sandwiched between France and Italy on the Mediterranean shore and famous for its annual Formula 1 Grand Prix. Ruled by a constitutional monarch, Prince Albert II, this miniature country is one of the world’s smallest, second only to the Vatican City. It is possible to drive the Grand Prix course, twisting and turning through the streets, past the world-famous Monte Carlo Casino which generates much of Monaco’s wealth. Rising steeply from its beaches, the picturesque French border town of Menton has an Italian feel. Famous for its citrus fruit, the town hosts an annual lemon festival and has links with many well-known artists including Jean Cocteau. It’s just a short trip from here into Italy, to the neighbouring town of Ventimiglia with its Roman remains and popular weekly market. One of the top tourist attractions on the Riviera is the Villa and Gardens of Ephrussi de Rothschild, at St Jean Cap Ferrat. Oozing Belle Epoque glamour and style this spectacular site overlooking the sea was created by Beatrice de Rothschild, wife of wealthy banker Baron Maurice de Ephrussi, in the early 20th century. Filled with her collections of fine art, antique furniture and porcelain the property was bequeathed to the Institut de France on her death. It offers a rare glimpse of how the ‘other half’ live on this secluded, exclusive peninsula. 15% per week off all remaining dates in July & August. 10% per week off all other dates. Offers available on shorter stays in May. Please contact for details. 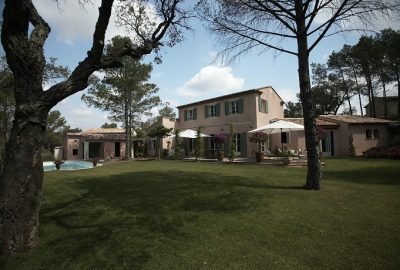 Splendid 18th Century country house set in 300 hectares of wine estate located in the village of La Motte en Provence, 15km south of Draguignan and 40km north of St Tropez. 300€ per week off for parties of five or less (29/6-13/7 only). Pretty villa with large grounds and fenced pool. Located in the gorgeous Verdon region. 1 hour east of Aix en Provence. 10% off week commencing 13th July. Five-bedroom villa with private pool within superb golf and spa complex just 20km from Frejus and the coast. 150€ per week off for parties of four or less (29/6-27/9 only). Pretty villa with large grounds set in the Verdon region. 1hr east of Aix en Provence. Ideal for a family of 4. Superb villa with private pool, enclosed garden, sauna, air-conditioned bedrooms and south-facing terrace with barbecue just 3km from Antibes between Cannes and Nice. 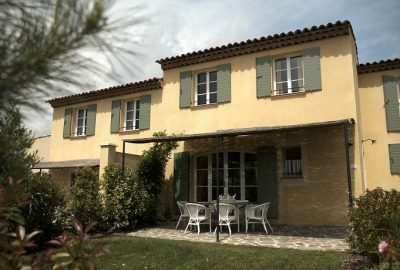 Villa with private pool, south-facing terrace and enclosed garden surrounded by countryside 5km from the medieval town of Les Arcs and 32km from the coast. 10% off 2 week stays completed by 3/8/19 or arriving after 14/9/19. 5% off 2 week stays between 27/7 and 21/9/19. 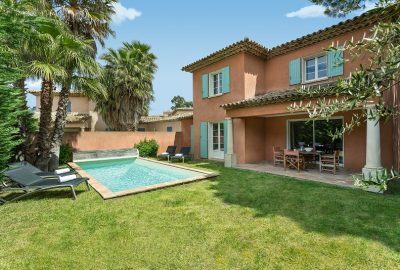 Detached, stylish villa with private pool, relaxing pool-side area, garden, lovely views and air-conditioning throughout, Sainte Maxime and a sandy beach 2km, St Tropez 15 min' by boat (15km by road). 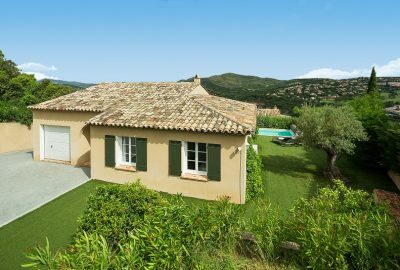 Detached, stylish villa with private pool, relaxing pool-side area, garden and air-conditioning throughout, 2km from Sainte Maxime and a sandy beach, St Tropez 15 minutes by boat (15 km by road). 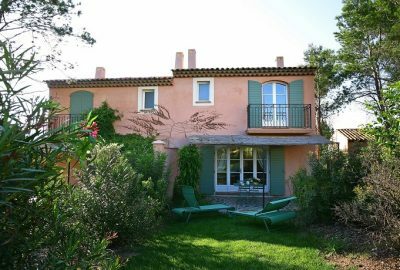 Detached two storey villa with private pool and air conditioning throughout, 2km from Sainte Maxime and a sandy beach, St Tropez 15 minutes by boat. 15% off all dates if booked by 30th April 2019. 35% off two-week bookings (excluding 13/7-17/8/19). Three-bedroom apartment with air conditioning throughout and access to shared pools and facilities at the Domaine de Camiole holiday resort, 33km from Frejus and the coast. One-bedroom apartment with air conditioning throughout and access to shared pools and facilities at the Domaine de Camiole holiday resort, 33km from Frejus and the coast. Two-bedroom apartment with air conditioning throughout and access to shared pools and facilities at the Domaine de Camiole holiday resort, 33km from Frejus and the coast. 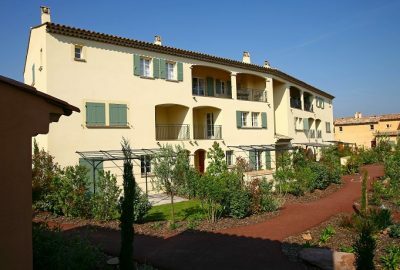 Two-bedroom apartment with access to an indoor and outdoor pools within superb golf and spa complex just 20km from Frejus and the coast. Three-bedroom semi-detached town house with access to indoor and outdoor pools within superb golf and spa complex. Coast: 20km. Two-bedroom semi-detached town house with access to an indoor and outdoor pools within golf and spa complex. 20km from the coast. 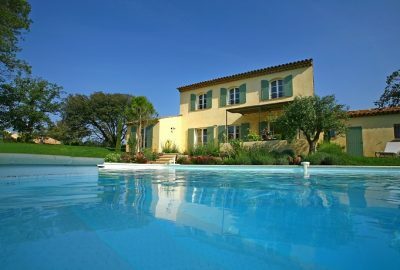 Spacious four-bedroom villa with private pool within superb golf and spa complex just 20km from Frejus and the coast. 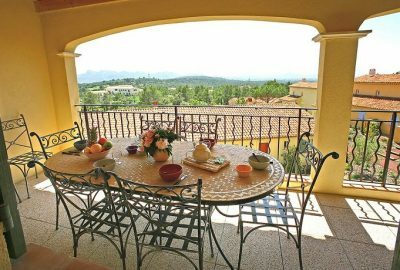 Four-bedroom villa with private pool within superb golf and spa complex just 20km from Frejus and the coast. 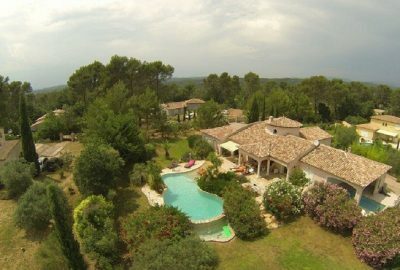 Attractive villa set in Domaine de Fayence with tennis courts, spa and fitness room. Fayence village: 4km. Lovely flat garden. Reversible air conditioning throughout the villa. Brand new villa with private heated pool. Quiet neighbourhood. Enclosed grounds, 3 ensuite bedrooms. Air conditioning. 300m from pebble beach. Shops within 10 min walk. Marseille airport 1 hour. Superb villa with large private pool, magnificent views over the ruins of Grimaud castle and St Tropez Bay, air-conditioning, enclosed garden and terrace with barbecue. 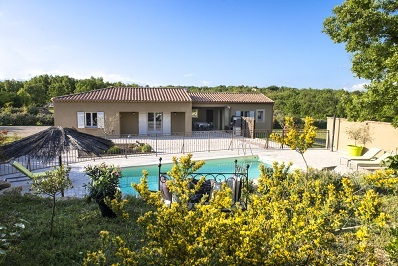 Villa with stunning views of St Cassien Lake, enclosed grounds with large pool and summer kitchen, just a short drive from the perched village of Montauroux.